This is a historic event. One that parallels our current studies of Medieval Europe. Regarded as a doctrinal conservative, the pope, 85, said that after examining his conscience “before God, I have come to the certainty that my strengths, due to an advanced age, are longer suited to an adequate exercise” of his position as head of the world’s Roman Catholics. 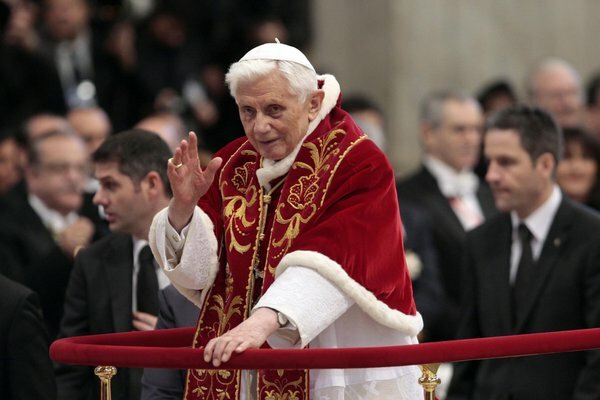 The announcement is certain to plunge the Roman Catholic world into frenzied speculation about his likely successor and to evaluations of a papacy that was seen as both conservative and contentious. He was a popular choice within the college of 115 cardinals who elected him as a man who shared — if at times went beyond — the conservative theology of his predecessor and mentor, John Paul II, and seemed ready to take over the job after serving beside him for more than two decades. The last pope to resign was Gregory XII, who left the papacy in 1415 to end what was known as the Western Schism among numerous competitors for the papacy. Elisabetta Povoledo reported from Rome, and Alan Cowell from London.